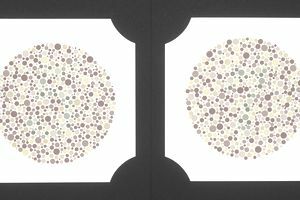 Color blindness will not make you ineligible to join the U.S. armed forces. But it will make you ineligible for some military occupational specialties, and for good reason. Prospective recruits generally take one or more of three color vision tests when they arrive at a Military Entrance Processing Station (MEPS). An inability to distinguish red from green, or even a vivid red from a vivid green, will prevent a recruit from performing some military occupational specialties (MOS) or ratings. The operational or safety aspects of some military jobs require an ability to distinguish between colors, especially those used for signal lights and flares. Since safety is the main reason for the requirement, this standard is never waived. For instance, recruits are not admitted to the Navy SEALS or the Navy Special Warfare Combatant-Craft Crewmen (SWCC) if they fail the red/green colorblind test. Some combat operations jobs in the Navy and Marine Corps require soldiers to be able to distinguish vivid reds and greens, as do Army and Air Force Special Operations and Aviation jobs. If you're colorblind, your best choice is to go ahead and apply for the specialization that interests you. If you fail one of the three tests you may pass others, and still be eligible. The tests used by the military are the Pseudoisochromatic Plate (PIP) Set, the Farnsworth Lantern (FALANT), and the OPTEC 900 Color Vision Tester. Which test is used to assess your vision is up to the military's discretion. It often depends on which facility the soldier goes to for the physical. For the PIP test, the subject is shown a series of plates, each with a large number made from colored dots on a background of dots that have a different color. The subject must identify the number displayed on each plate. The FALANT test was developed to test the ability of sailors to identify signal lights at sea. It tests the subject's ability to distinguish red from green lights and also tests for the rarer inability to detect blue shades. The OPTEC 900 Color Vision Tester is an updated version of the FALANT test, and like it requires the test subject to distinguish the colors of lights. Some military jobs, especially in the Army and Marine Corps, do not require normal color vision but only the ability to distinguish red from green. If you're concerned about how your color vision will affect your ability to perform military duties or which jobs you'll be eligible for, discuss your concerns with a military recruiter. But first, take the test at MEPS to find out if you're eligible for the specialization you want to pursue.